Come for the tennis, stay for the food. From a filet mignon steak sandwich to a personal pizza to a donut ice cream sandwich, we've mapped out where and what you should eat at the 2017 U.S. Open. I have a confession to make: I’m a sports snacker. Forget the big meals and clunky cardboard cup-holders filled with fried-this and fried-that or burgers with all of the fixins and sides. I prefer foods you can crunch and munch on. Hand over that big bag of peanuts (in the shells, please) and an ice-cold beer at the baseball game. Give me a bucket of buttery popcorn or a giant soft pretzel with spicy mustard at an NBA arena. I’ll also gladly accept a frosty cup of Carvel soft serve swirl to drown my sorrows in during a football game at MetLife Stadium. (Yes—I’m unfortunately a New York Jets fan.) But when it comes to eating actual meals at the ballpark or arena, it’s just not my thing. Unless, that is, I’m at the U.S. Open. You’ve likely heard the stats: 90,000 pounds of beef, 9,000 pounds of lobster, 225,000 hamburgers and hot dogs, plus 7,000 specialty tennis ball cookies. All of that food will be for the more than 700,000 people expected to attend the final tennis major of the year at the USTA Billie Jean King National Tennis Center in Flushing Meadows. Starting on Aug. 28, fans will flow in and out of the grounds to watch some elite tennis—but they also are coming to eat. Just as most U.S. Open-goers will check the day’s schedule and formulate a plan for seeing the matches, it’s also necessary to map out a meal plan as you navigate the grounds. There are so many options. From traditional sports fare (hot dogs, hamburgers, waffle fries) to local New York City hot spots serving up foodie-favorites (Melt Shop, Fuku and Korilla BBQ, to name a few) to more fancy, fine-dining cuisine, there truly is something for everyone. Maybe it’s the fact that the event is two weeks long, and each day has 12+ hours of matches, but the U.S. Open is the one place I cave in, ditch my snack statue, and order a full meal, be it a cheeseburger and fries, a rice bowl or a full personal pizza. Whether you’re looking for a quick bite or a hearty meal during the changeover, we’ve got you covered. We’ve rounded up the food options (and prices) you’ll see on the menus in the Food Village, restaurants and around the grounds at the 2017 U.S. Open. Located right in the middle of grounds, this is the central location for all of the concession stands, including stations for water, coffee, beer, champagne and more. The steak sandwich from Pat LaFrieda. The 163 Burger from Fuku. 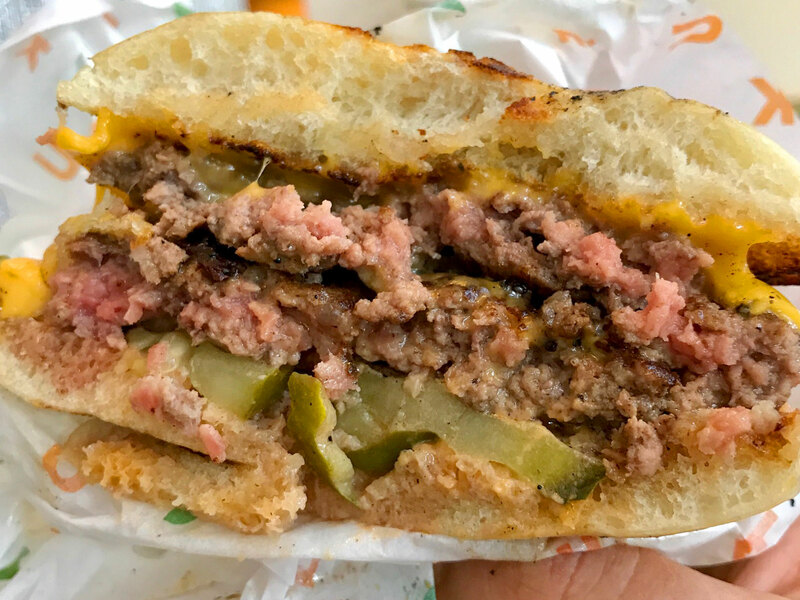 Momofuku chef and founder David Chang always brings his mouth-watering must-haves to Flushing Meadows, and this year Fuku has turned it up a notch with a new U.S. Open-exclusive burger, a specialty dessert item and more, all served up at two new locations. Other menu items: Spicy chicken bacon ranch sandwich; Fries with jalapeno seasoning. What once was only a food truck has now grown into a restaurant with multiple locations—and a spot in the U.S. Open Food Village. Other items: Korean tacos; Kimcheese fries; Pork and veggie dumplings. 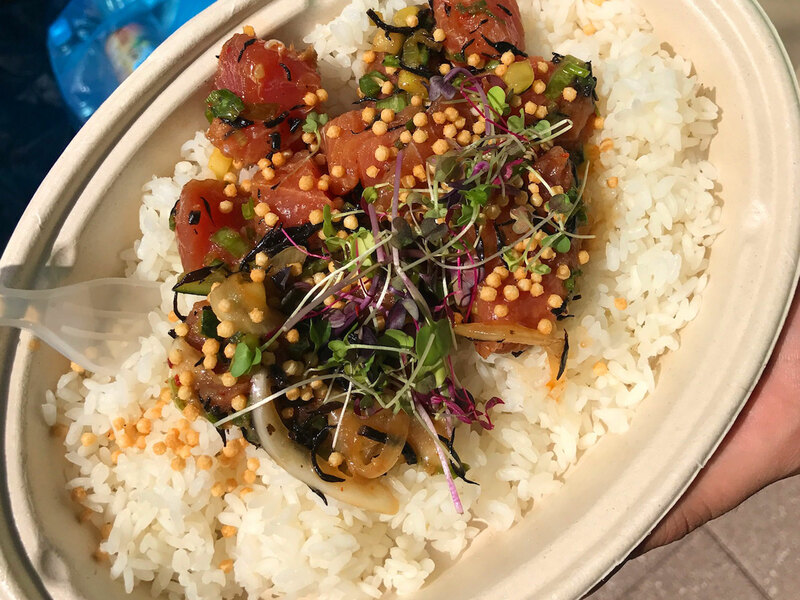 Poke bowl from Poke Yachty. The folks behind Korilla BBQ are bringing U.S. Open fans a new bowl to feast on this year: poke. One of the grilled cheese sandwiches from Melt Shop. 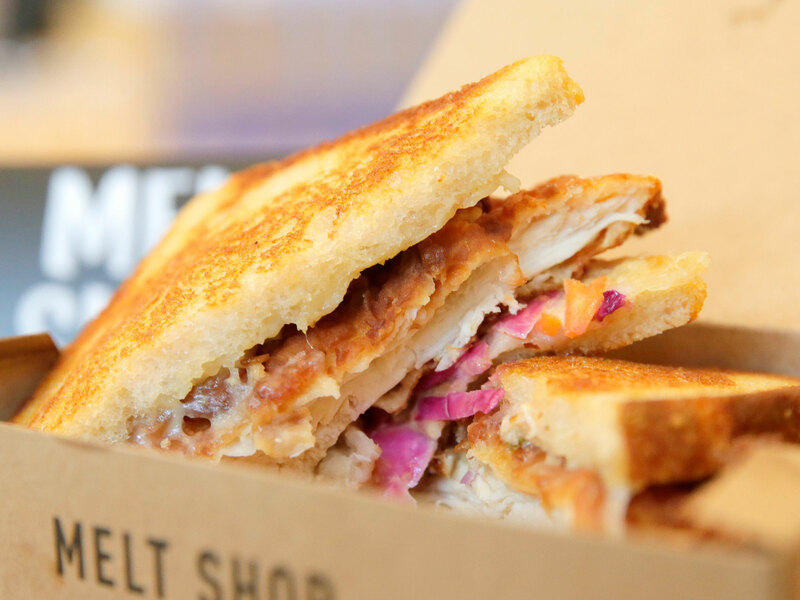 A go-to NYC lunch spot, Melt Shop’s U.S. Open offerings always deliver on three things food should always be: cheesy, crunchy and comforting. Other menu items: Cheesy tots; Deluxe grilled cheese with bacon. If you’re trying to keep it sorta-healthy while you spend the day watching tennis, grab a cold bottle of Evian and head over to Farm 2 Fork, where you can find some more nutrition options, such as salads with superfoods and more. Straight from Texas, Hill Country brings authentic barbeque to Flushing Meadows. Chef David Burke serves up a flavorful Mexican street food menu. If you only know crepes as banana-strawberry-and-nutella, Le Chef Paul will open your eyes to a whole new world with sweet and savory creations, including the Le Boeuf Bourguignon Crepe with skirt steak and cheese and the La Poulet Dijon Crepe with chicken. Morris Grilled Cheese: Near Court 17, this is a food truck that serves up a simple menu of killer grilled cheese sandwiches, including a classic with New York state cheddar and New Hampshire landaff cheeses, a gouda one with herb butter and bacon, and more. Soomsoom: Sort-of hidden over by Court 12, this vegetarian-friendly, healthy spot serves up fresh Mediterranean fare, including falafel sandwiches and salads. Joju: I didn’t get to taste the food from this modern Vietnamese Queens spot, which is new to this year’s concessions, but some of the offerings include a lemongrass chicken banh mi sandwich, loaded banh mi fries and a banh mi bacon dog. 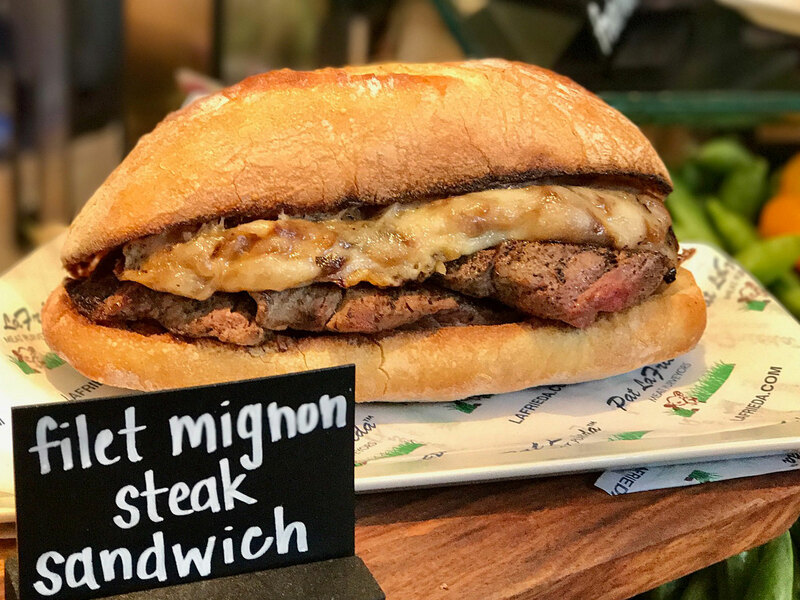 Dean & DeLuca: For the first time, this NYC staple brings its upscale market fare to the U.S. Open at two locations, in the Grandstand Food Village and at the Club Level in Arthur Ashe Stadium. Menu items include: on-the-go sandwiches, salads and snacks, including gluten-free options and performance bio-nutrition bars in flavors such as turmeric and ginger, matcha and espresso, manuka and mango and more. The new item from Lure Fishbar. Lure Fishbar: John McDonald’s Mercer Street Hospitality and chef Josh Capon give you taste of their Soho restaurant, Lure Fishbar, at Oyster Bar 7 by Grandstand stadium and at the Oyster Bar on the Club Level in Arthur Ashe Stadium. 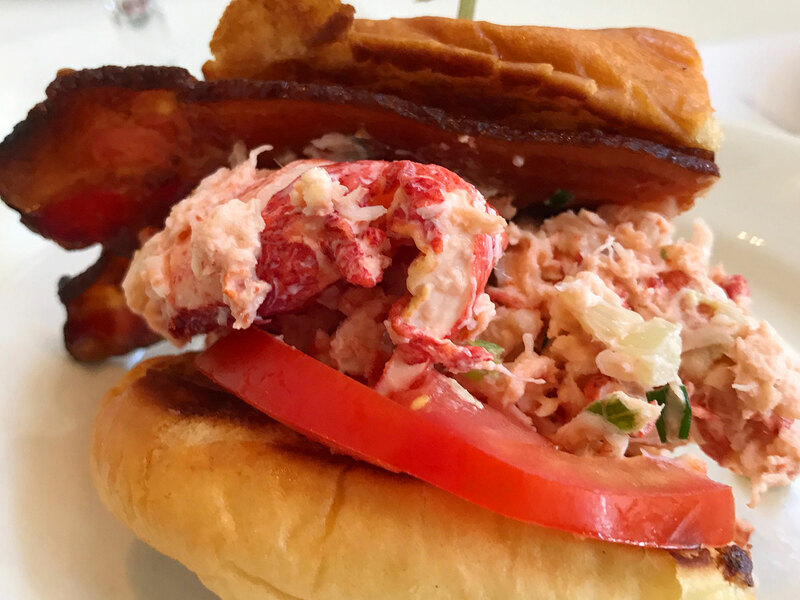 The highlight—and new item—this year is the lobster roll, served regular or club-style with a healthy piece of crunchy bacon. Wine Bar Food: Located in the South Plaza above the Mercedes-Benz Brand Center, we suggest you order the mozzarella and burrata plate. More fine dining: Mojito Restaurant & Bar, BLT Prime by David Burke, ACES and more. 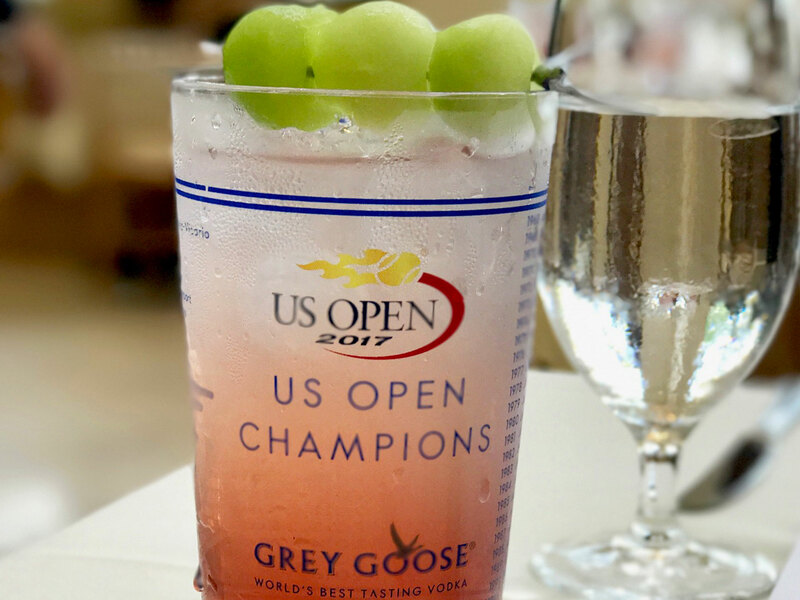 Grey Goose Honey Deuce: More than 275,000 melon balls will be used to garnish the U.S. Open’s signature cocktail. You should definitely get one and take the glass home as a souvenir.